The Bay of Quinte is world famous for its trophy walleye fishery. 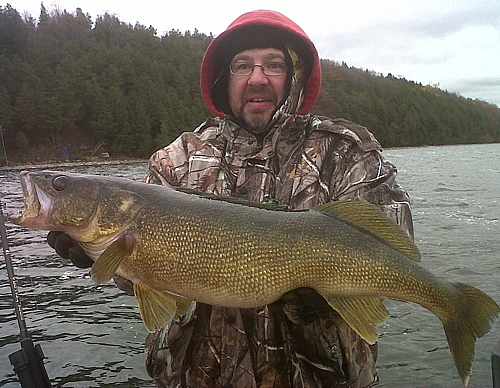 Every year the Bay of Quinte puts out more double digit weight walleye than any other walleye fishery in North America and the bulk of these trophy walleye are caught by clients on Bay of Quinte Fishing Charters. Why Book A Fishing Charter? Many Anglers have come in search of these true trophy walleye on their own and left unsuccessful. The following Bay of Quinte fishing charters have put their time in and have learned what it takes to consistently put these trophy Bay of Quinte walleyes in the boat. They have the experience, equipment and know how to make your day a rewarding one. Some Anglers seek to learn on their own but fact is many Anglers learn more on a single outing with a Bay of Quinte Fishing Charter than they have on their own. Think about the time wasted and money spent on gas, lodging, eguipment, lures and more over multiple trips trying to figure these fish out. We hope you and your friends have a great day on the water with your Fishing Charter and dont forget to stop by the discussion board and post that picture of your Trophy Walleye.